Julie is a unique volunteer to our program, as she delivers one of our ‘Let’s Do Lunch’ routes. This means that Julie volunteers her lunch break once a week to deliver meals to our seniors in need. While it is shorter route in order to be conscious of her time away from work, Julie has been able to get to know and bond with some amazing clients over the last year and a half that she’s been volunteering with us. Volunteering with Meals on Wheels has been something that Julie has always wanted to do, but since she works full time, it has been hard to fit volunteer time into her schedule. That is until she heard the radio ad about 2 years ago that promoted the Meals on Wheels Let’s Do Lunch campaign, encouraging folks to spend their lunch hour once a week delivering meals to seniors, and she thought that was something she could definitely do. Julie was born and raised in Alma, Michigan and attended Ferris State University and earned her degree in advertising and graphic design. She then moved to Grand Rapids and worked at Grand Rapids magazine selling advertising and then was an Advertising Manager for 24 years at Johnson Carpet and now lives in Grandville and is working at Grandville Printing in the Digital Printing department. Julie moved to Grandville so her, now 14-year-old, son could attend Grandville schools and so she could be closer to work. 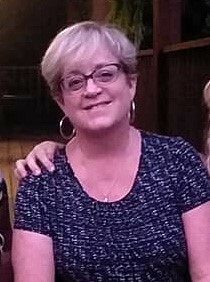 In her free time, Julie loves to go to plays and concerts, and is a huge music fan, recently seeing Pink, Fleetwood Mac, REO Speedwagon and Steely Dan, to name a few. She also enjoys playing euchre with friends, camping and hanging out with her son. When asked why she volunteers, Julie stated that, “it’s important to appreciate where you came from and what you have and to give back to the community you live in and help others.” She also says that it is so rewarding to bring people food and be able to put a smile on their face and brighten their day and that it’s quite the feeling when her clients are genuinely happy to see her. We are so appreciative of all that Julie does and the people she serves are too. Shelly Smalligan, our Delivery Supervisor, admires the fact that Julie spends her lunch break delivering meals to homebound seniors and says, “Julie is very reliable and genuinely cares about her clients. If someone is ever missing from her route log, she always makes a point to ask the delivery hub if they are doing okay.” Julie’s generosity, reliability, and giving spirit is something to strive for. We are so thankful for Julie’s commitment to our program and so grateful to have her as a part of our team. We appreciate her, and others like her who give so generously of their time to reach homebound seniors in our community. Thank you, Julie!